U.S. Immigration and Customs Enforcement (ICE) investigations no longer only target organizations that knowingly employ unauthorized workers. Now organizations may be audited and penalized for incomplete, inaccurate or missing Form I-9s. With ICE fines totaling more than $9 million in FY2011, an increase of more than 1,200 percent in three years, Form I-9 compliance is something organizations should be taking seriously. 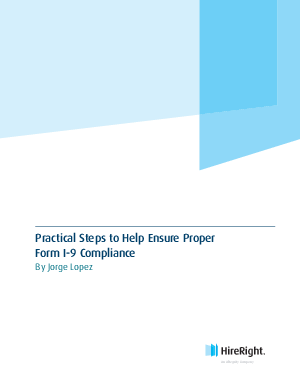 In this white paper, learn practical steps your organization can take to help ensure Form I-9 compliance, as well as the benefits of an electronic I-9 solution.